This is a circular walk using some permitted paths on the Iford Estate. They have been paid to keep them open till October 2018 but say that they will keep them open indefinitely. Trains run to Lewes from London, Brighton, Eastbourne and Hastings. The 123 bus runs from Iford to Lewes and Newhaven, stopping on the main road. It runs about every two hours during the day Monday to Saturday. In Lewes only. Café on station, shops by station, pub just after Station on outward walk. Café at Anne of Cleves House just off the route. Leave Lewes station by the main entrance. Turn left and then bear right at the mini roundabout. Then keep straight ahead past the pub on your right and Southover Church on your left. 1).Turn left down a road immediately after the church. (for early refreshments keep straight ahead to historic Anne of Cleves House, which has a café) Pass under the narrow railway bridge. Very shortly afterwards come to a car park on your right. Turn right into the car park, walking in the general directions of the rights of way signs at the entrance. Walk to the point at which the car park narrows to find steps down on your left. Go down the steps and then turn right and then left to go under the A27 road. When you emerge from under the bridge turn left. 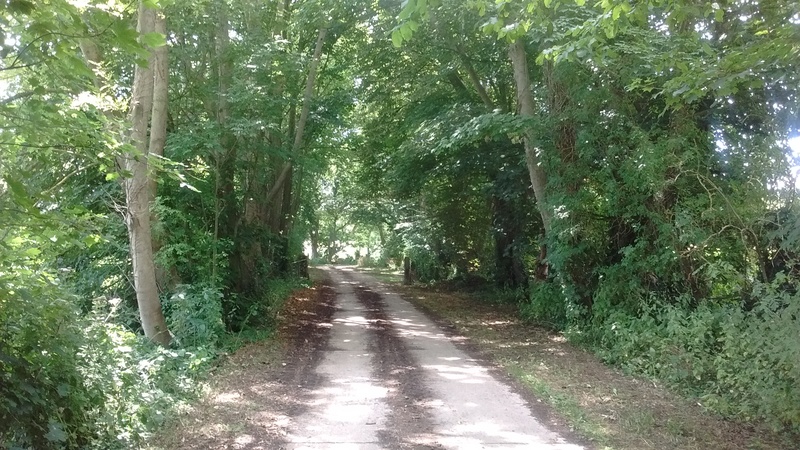 Walk along the lane parallel to the A27. At the end follow the lane round to the right. In July 2017 there was a private, no footpath sign here. If it is still there ignore it. The Iford Estate has agreed to remove the sign and others like it. In 2008 the landowner concluded an agreement with Natural England whereby, in return for payment, the landowner, the Iford Estate, would open the path to the public for a period of 10 years. Natural England never signposted the path, which is their job, and the Iford Estate never removed the private signs, which is their job. Nor did Natural England put the route on their web site under the pages where permissive access had been agreed. So the route remained entirely unknown until a local told the Ramblers about the route and, following a request for information, Natural England confirmed the path was open. Below you will find their confirmatory email. Although the 10 years have now expired the path remains open for the time being. Walk up the lane to Rise Farm. You may see another private no footpath sign. You can ignore this too. 2) Go through the farm and head straight ahead along a track past an attractive older building on your right. Come to a T junction by some farm buildings. The main track goes left, by you go right to enter a field. This field is used for parties and events, so you may see tents erected. Bear left and head towards a metal gate. (You are heading south here) Go through the gate and walk diagonally to the right across the field to reach a track on the right hand side of the field. Bear left on the track to reach a gate with a stile on the left. Cross the stile and turn right along a track. Follow the track to its end. Near its end the track turns 90% to the left and emerges on a small road in Iford. 3) You may want to turn left to have a look at Iford Church (A), but otherwise turn right along the road, which turns first right and then left. Look out for a footpath sign. The path crosses the road. Turn right here. 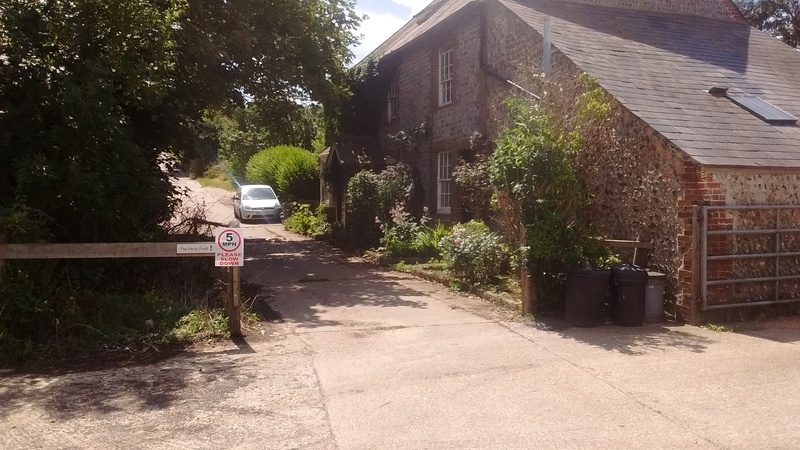 You can tell if you are at the right place because, apart from the footpath sign there is an attractive older house on the left and a stony drive on the right. The official path goes between the house and the drive, but you can use the drive if you like. You are now back on rights of way. At the end of the drive turn left over a stile into a field and then turn right to walk first along the right hand side of the field and then along the left hand side of the next one. Now you emerge into an open field. Walk straight ahead. There is usually a walked out path through this field but it can be ploughed up. Report any problems to rightsofway@eastsussex.gov.uk. In the middle of the field you arrive at a signpost. Follow the route slightly to the right ahead to reach the edge of the field. Go through the gap in the hedgerow and emerge on a concrete track. Turn right here and then almost immediately left onto a narrow footpath. The path can be difficult to negotiate. Emerge into an open field and follow the path ahead, which is usually clearly shown on the ground. You reach an area of long grass right be the Kingston Road. 4) Look for a signpost on your right and make your way over to this. You should not need to go as far as the road. Look for a raised embankment by the side of a wide drainage ditch which is usually full of water. Walk along this embankment to its end. Descend the embankment at its end (can be slippery after rain) and go through a gate (large puddle after rain) Then turn left, aiming for the bridge under the A27 you passed under earlier. Pass through the bridge, turn right, then left up the steps you used earlier, pass through the car park and turn left. (The Southdown Club opposite has a public café, but it does not have much character). Turn left at the road and then right to return to Lewes station. A). Iford Church and village. There is an attractive Norman church which has survived its Victorian mutilation quite well. There are also some attractive houses. There is still some flavour of how villages like this must have been 100 years ago. There is a really lovely seat you can sit on outside the church if now seems a good time for a rest. B). Lewes Priory. You can find more details about the Priory here and on the site. The priory was one of the earliest examples of a holiday souvenir as it was built by local Lord William de Warrene after a visit to the Priory in Cluny. He decided he would like something similar and taxed locals heavily to build the priory. Following its dissolution by Henry the eighth the locals decided to get their money back by removing various bits of the priory to use as building materials, hence its present state. C). The Dripping Pan, home of Lewes Football Club, was once part of the Priory. In 2017 the team made history by becoming the first team in the world to pay its female and male players on the same basis. This was made a little easier by the fact that the women’s team were doing well, taking on the likes of Tottenham Hotspur and sometimes beating them, whilst the men’s team was struggling to beat Corinthian Casuals and the Metropolitan Police team.